Bioengineers at UC San Diego have developed a new blood test that could detect cancer—and locate where in the body the tumor is growing. By screening for particular DNA signatures from both cancer cells and normal cells in the body, researchers discovered a new clue that indicates not just the presence or absence of a tumor, but also where it resides. The proof-of-concept study could provide a way to diagnose cancer early on without having to do invasive surgical procedures like biopsies. A team of engineers at UC San Diego and La Jolla-based startup Nanovision Biosciences Inc. have developed the nanotechnology and wireless electronics for a new type of retinal prosthesis that brings research a step closer to restoring the ability of neurons in the retina to respond to light. The researchers demonstrated this response to light in a rat retina interfacing with a prototype of the device in vitro. Explorers planning to settle on Mars might be able to turn the planet’s red soil into bricks without needing to use an oven or additional ingredients. Instead, they would just need to apply pressure to compact the soil—the equivalent of a blow from a hammer. While proposals to use Martian soil to build habitats for manned missions on the planet are not new, this is the first that shows astronauts would need minimal resources to do so. Engineers at UC San Diego have developed a nanosized optical fiber that's sensitive enough to feel the forces generated by swimming bacteria and hear the beating of heart muscle cells. It can detect forces down to 160 femtonewtons and sound levels down to -30 decibels. Applications of the device include measuring bio-activity at the single cell level, or an ultra-sensitive mini stethoscope to monitor cellular acoustics in vivo. Engineers at UC San Diego have developed the first soft robot that is capable of walking on rough surfaces, such as sand and pebbles. The 3D-printed, four-legged robot can climb over obstacles and walk on different terrains. The robot could be used to capture sensor readings in dangerous environments or for search and rescue. A new smart glove wirelessly converts signs of the American Manual Alphabet into text and controls a virtual hand to mimic sign language gestures. The device, which engineers call “The Language of Glove,” was built for less than $100 using stretchable and printable electronics that are inexpensive, commercially available and easy to assemble. While the glove is capable of gesture recognition, researchers at UC San Diego are developing the glove to be used in a variety of other applications ranging from virtual and augmented reality to telesurgery, technical training and defense. Nanoengineers at UC San Diego have demonstrated for the first time using micromotors to treat a bacterial infection in the stomach. These tiny vehicles, each about half the width of a human hair, swim rapidly throughout the stomach while neutralizing gastric acid and then release their cargo of antibiotics at the desired pH. This micromotor-enabled delivery approach is a promising new method for treating stomach and gastrointestinal tract diseases with acid-sensitive drugs, researchers said. Squid ink might be a great ingredient to make black pasta, but it could also one day make getting checked for gum disease at the dentist less tedious and even painless. By combining squid ink with light and ultrasound, researchers have developed a new dental imaging method to examine a patient’s gums that is non-invasive, more comprehensive and more accurate than the state of the art. How many robots does it take to screw in a light bulb? 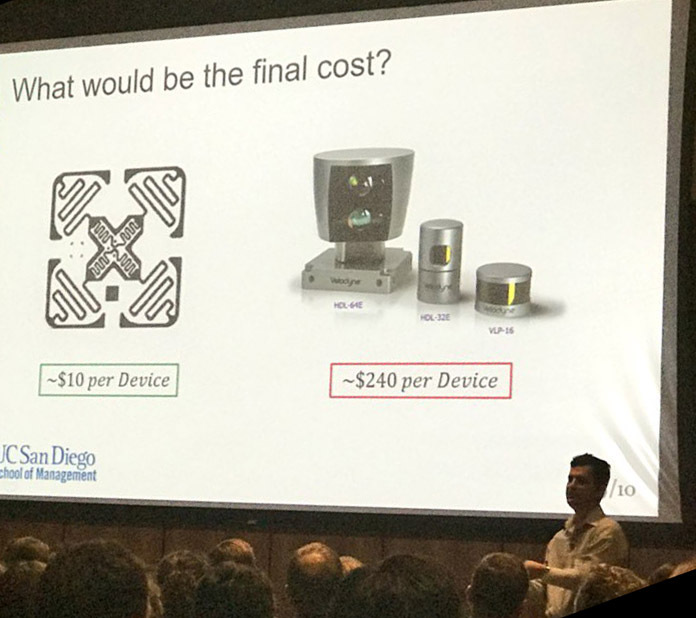 The answer: just one, assuming you’re talking about a new robotic gripper developed by engineers at UC San Diego. The engineering team has designed and built a gripper that can pick up and manipulate objects without needing to see them or be trained. The gripper not only can twist and sense objects, it can also build models of the objects it’s manipulating. This allows the gripper to operate in low light and low visibility conditions, for example. Kristine Khieu might be studying the spine, but she has her sights set on space. 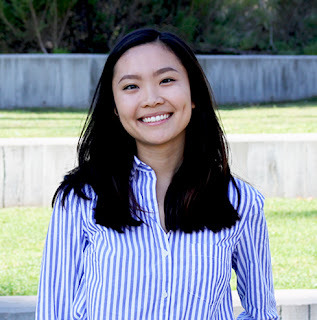 The fourth year bioengineering undergraduate at UC San Diego was one of six students nationwide selected to receive a prestigious Universities Space Research Association (USRA) scholarship for her research on the effects of a zero-gravity environment on spinal muscles. Khieu was also commended for her science, technology, engineering, art and math (STEAM) outreach efforts. USRA awards scholarships to undergraduate students who tackle challenging scientific questions in the areas of space research and exploration, particularly astrophysics and astronomy, and create technologies and solutions that positively affect people’s lives. Khieu plans to apply to medical school, but said having an engineering background will prove useful in the medical field and beyond. Outside of classwork and lab work, Khieu finds time to serve as president of the Tritons for Sally Ride Science club at UC San Diego, focused on STEAM outreach to engage the next generation of innovators. Khieu was awarded the Frederick Tarantino Memorial Scholarship Award, a $4,000 scholarship in memory of Tarantino, a former USRA president and CEO.